A bit of fun for Tuesday. This isn’t the first time Google have released such an easter egg. There is also the Zerg Rush easter egg, click here to try it out, basically when you enter the search your results are are attacked by a horde of bloodthirsty letter Os. Armed only with your mouse you have to set about them and do your best to preserve your precious results. This was based on the excellent strategy game StarCraft. My personal favourites are last three as I’m a massive fan of wordplay and incessantly, much to the annoyance of the office, crack puns. 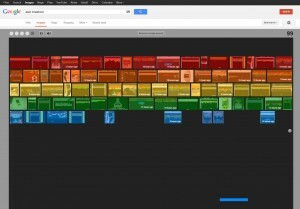 What’s your favourite Google Easter Egg?